Quick update here for builders to confirm the technique of taping down the peel ply and applying epoxy in the marker lines worked really well. The table side of these panels came out smooth as glass. 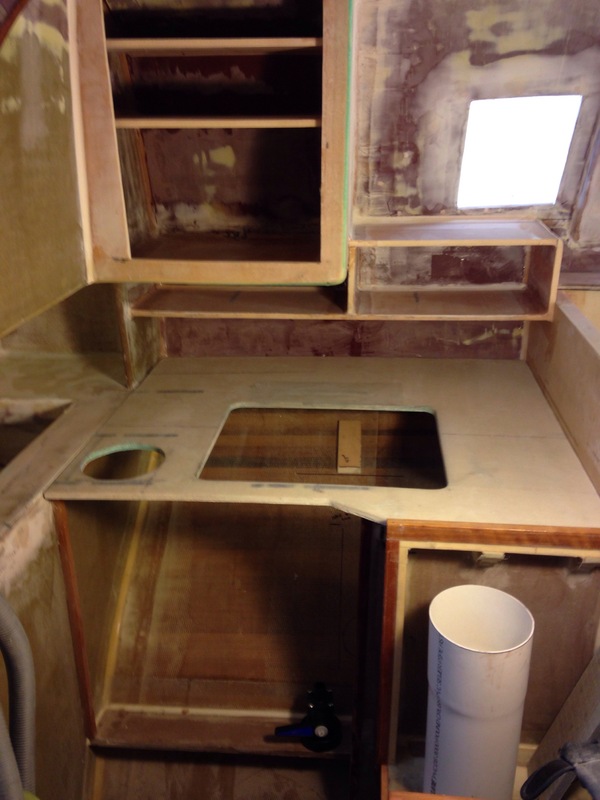 The galley countertop got some good news – the sheet metal neighbor is going to make a full stainless steel cladding to cover the whole thing. Good idea Jeanne! 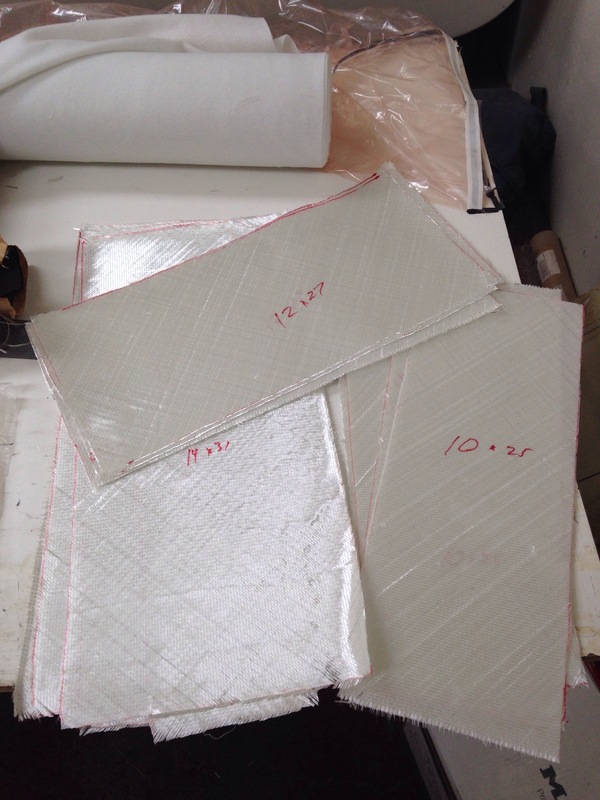 A very light, very durable solution. Today’s lamination table finishes the shelves of various cabinets, and the long piece is a valence / light box over the dinette. Actually had to hunt around for tasks to fill the table – that is a great sign, ie we’re almost done with primary parts fabrication! The boom is done and ready for paint. 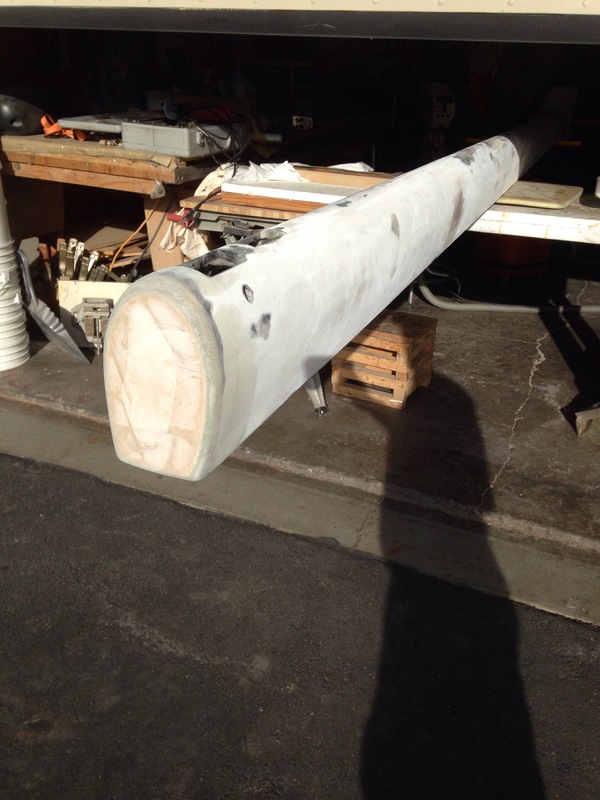 This was a really satisfying project, remaking this spar from Transit of Venus’ original mast. The control lines for three reefs plus the outhaul live inside the boom. 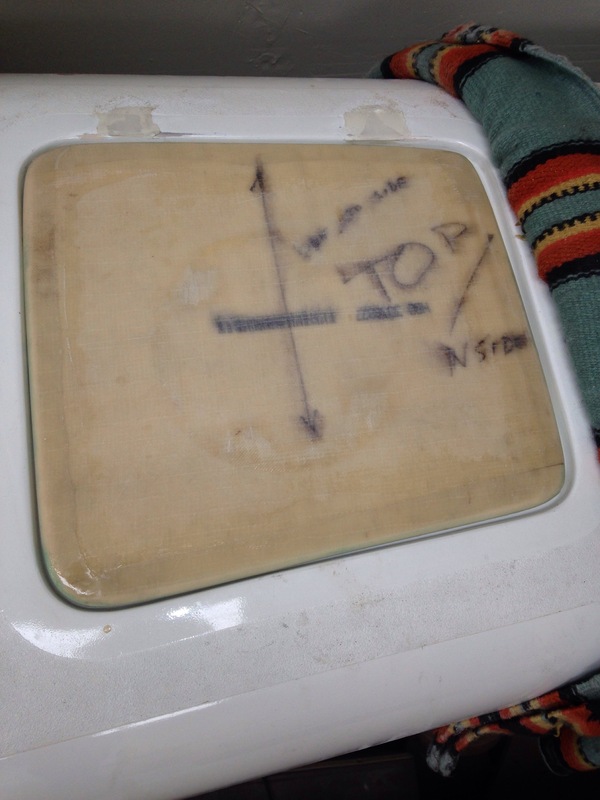 The hole on the end of that last photo will hold a spectra loop to catch the topping lift. Three reefs around the sheaves in back, with the outhaul just ahead. Here’s the boom end with line guides inside, before capping the end permanently. 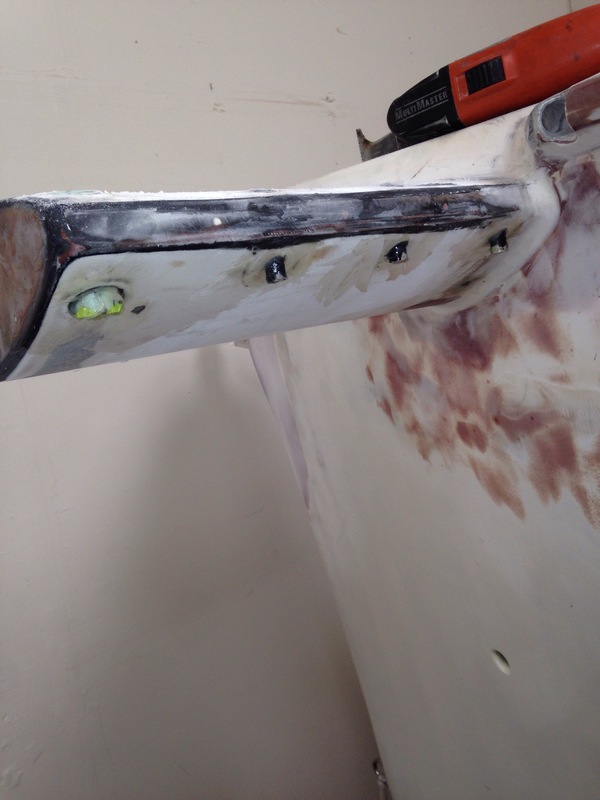 Next up was replacing a hatch on the port float bow (that unfortunately went missing when we moved the hulls 3 years ago). 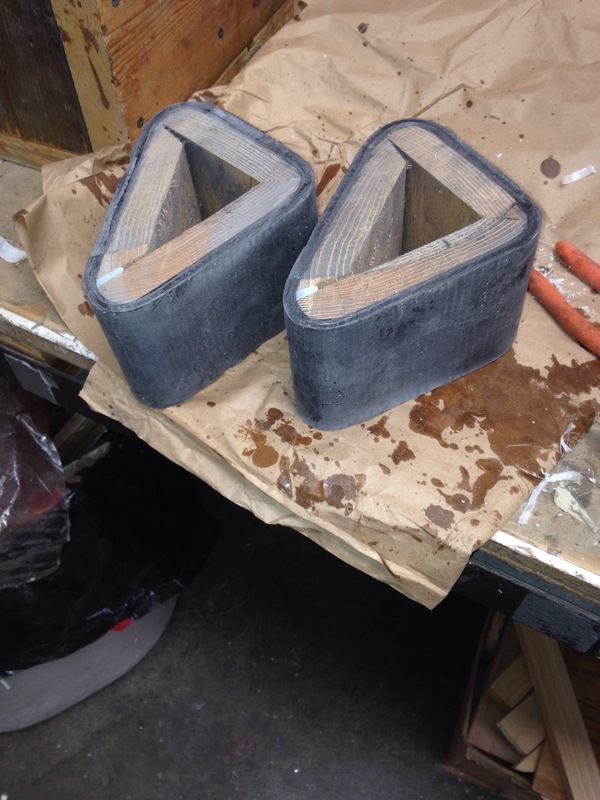 We took the inspection port off the starboard one and used it as a mold to get the curve right. This will now sit idle until a new 10″ port shows up to match the existing one. And up in the cockpit, we finished up more details. 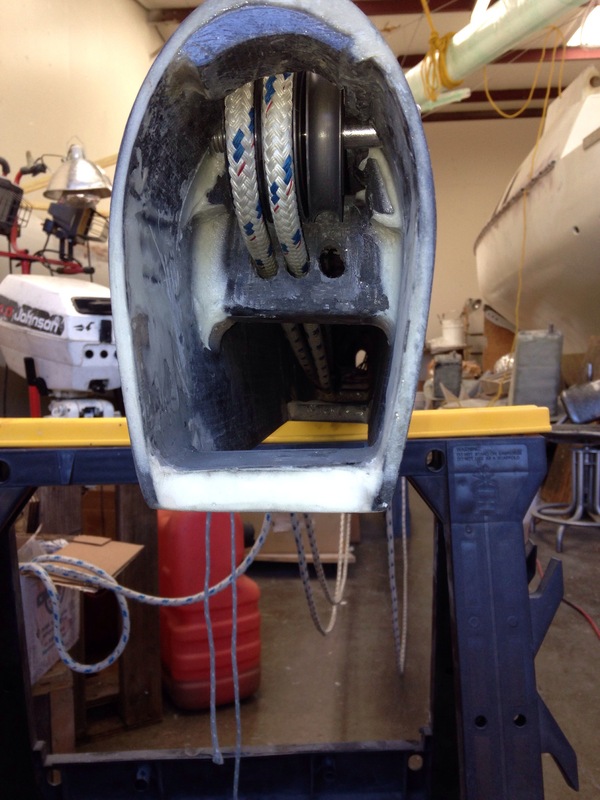 All six winches are now mounted; this mid-cockpit pair will handle the reacher and spinnaker sheets. 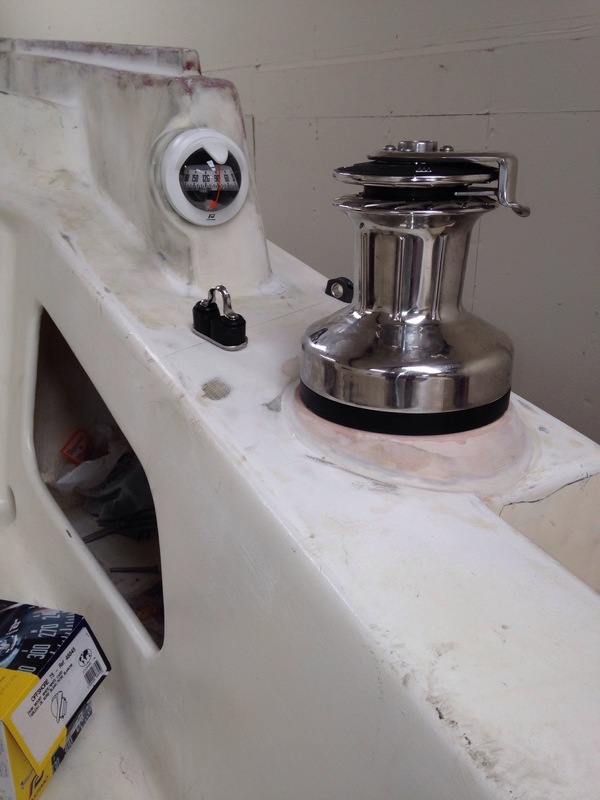 The barber hauler controls are just ahead of the winch, and check out the new little pods for the compasses – there’s a duplicate of this over on the port side. Seems like a good spot, up and out of the way of seated crew / guests, and right in the sight lines of the driver from either down in the cockpit or out on the beams and/or nets. 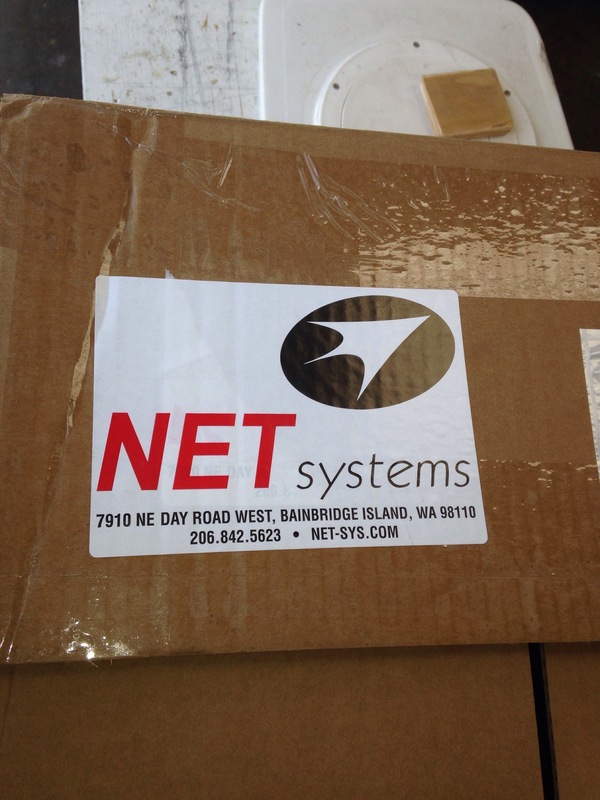 Speaking of the nets – they’re here! 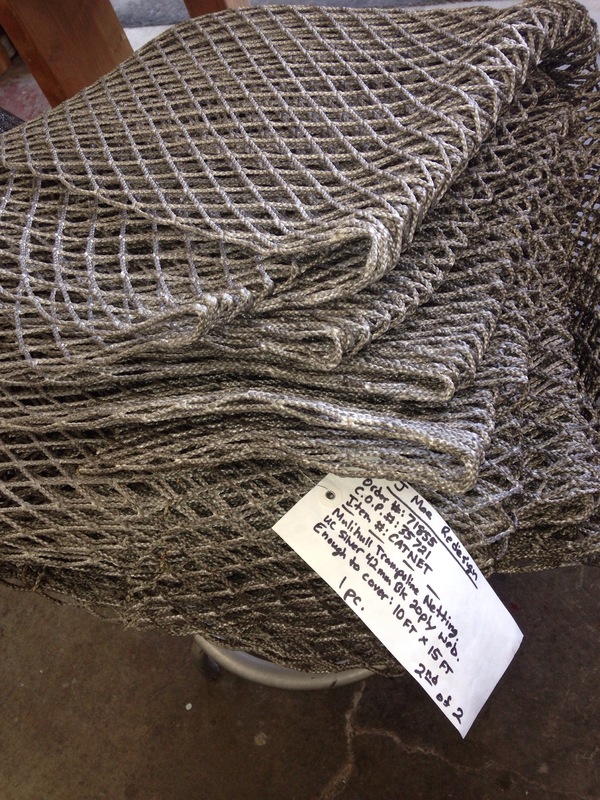 Recall last fall we saw F22 Dart’s at the first launch, and we followed up in purchasing 30lbs of Dyneema mesh. Yes, these are fishing supply people that sell it by the pound. This same stuff was on the America’s Cup boats last year, and doing it this way is costing about 1/3 or ordering complete trampolines from known suppliers in FL, etc. 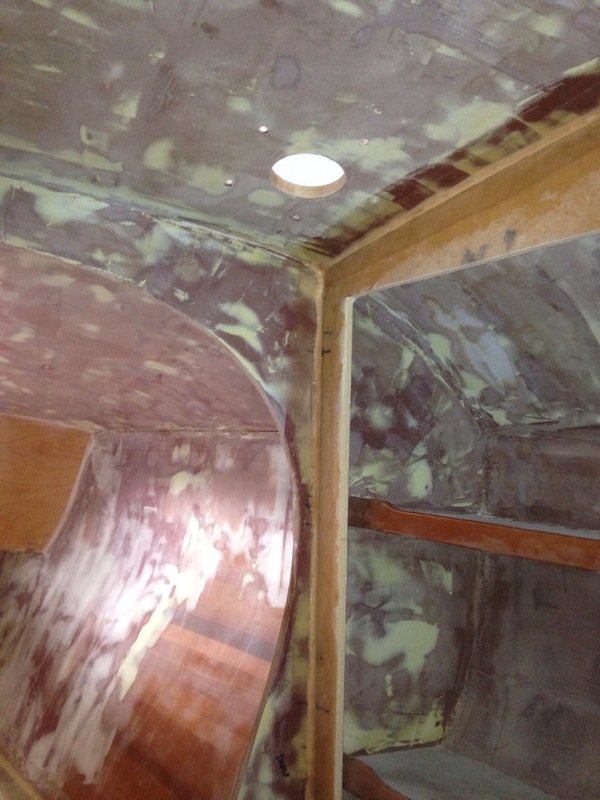 Work this week in the main cabin shows progress quickly because each task is smaller. 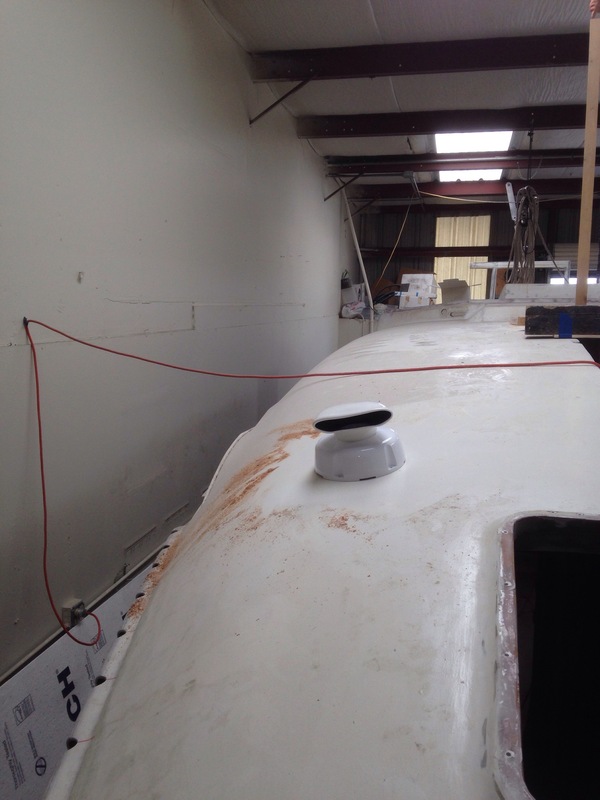 We’ve figured out a BlueSea 12volt electric distribution system, and the complete panel will live here above the radios and chart table. 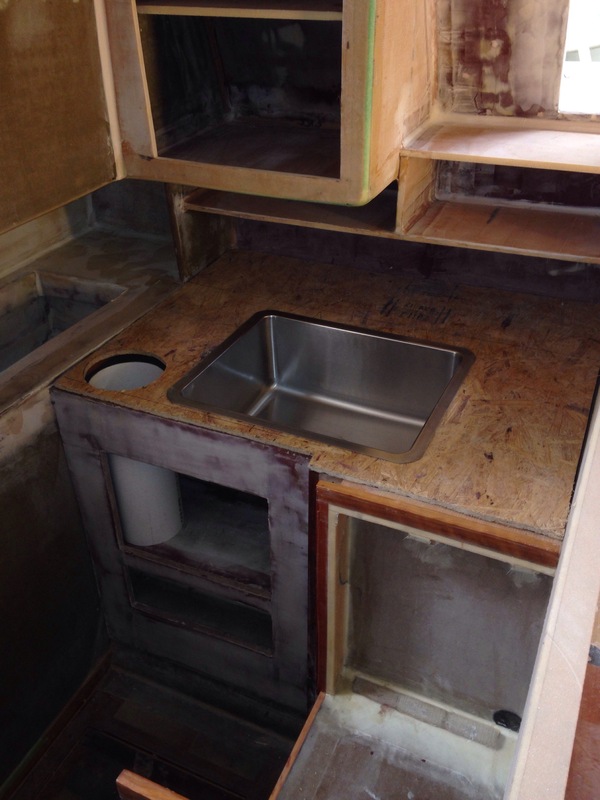 The galley is figured out now. The propane stove/oven unit got it’s mounting built (but installed photo forgotten). The metal trim of the unit fits right over the raised wooden rails and trims out nicely. 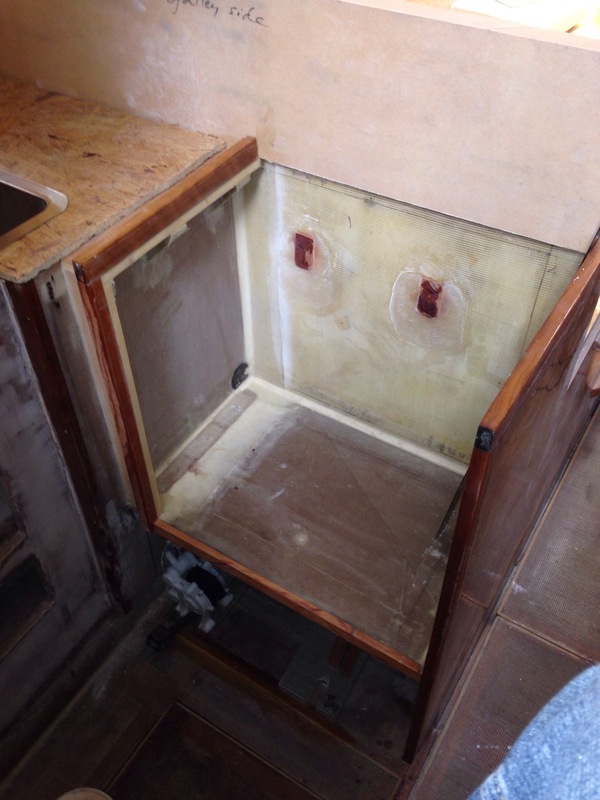 Then looking to the left, we get a big, deep sink – after all, this is a second home, right Dad? 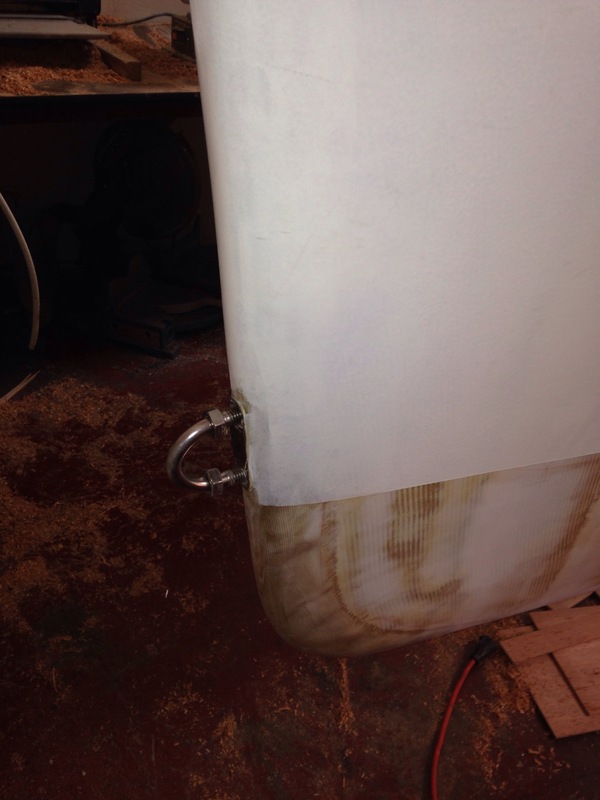 The circle left of the sink is a garbage can built in to the countertop, so Jimbo can say it’s a real boat. And the freezer unit is at your far left in the photo. In the sink there’s a very deep strainer basket – that’s important to catch any food scraps as the drain water is set up for a grey water catch tank which will supply the toilet flushing. When we have a few gallons of “grey” stored up, the sink will be switched to drain overboard, via reachable levers in the cabinet. More on that later. 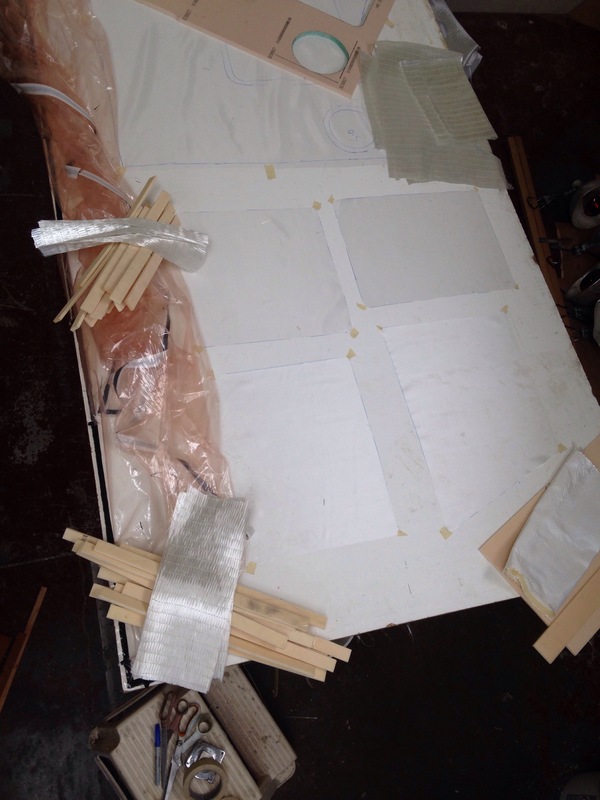 I noted in F39 Henny’s and F33 Arno’s blogs recently each spoke of it taking about three hours to get vacuum’d panels all set up and working. That’s my number too. This morning was about 3 1/4 hours getting all the fabrics cut, bagging supplies ready and prepping the after lunch lamination session. 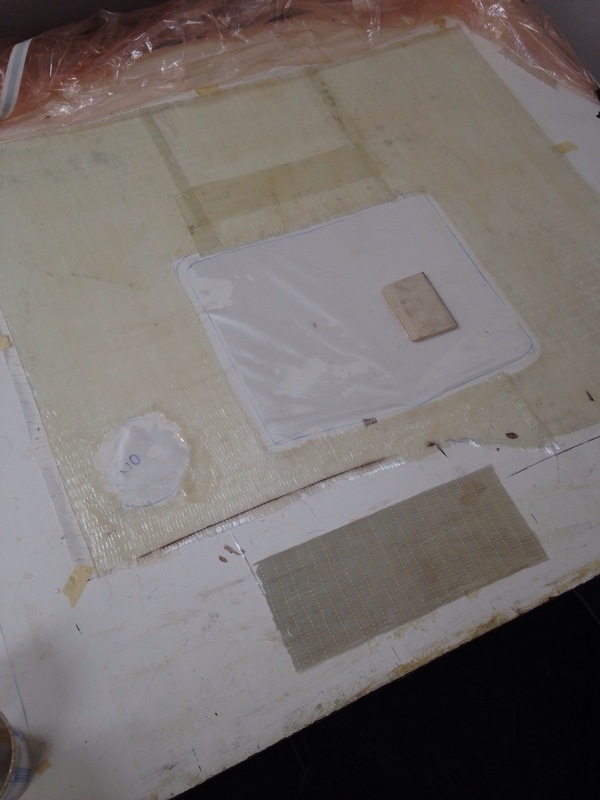 Last week we let a wetted sheet slip inside the bag for that float hatch and developed a wrinkle in the piece (that had to be ground away and patched). 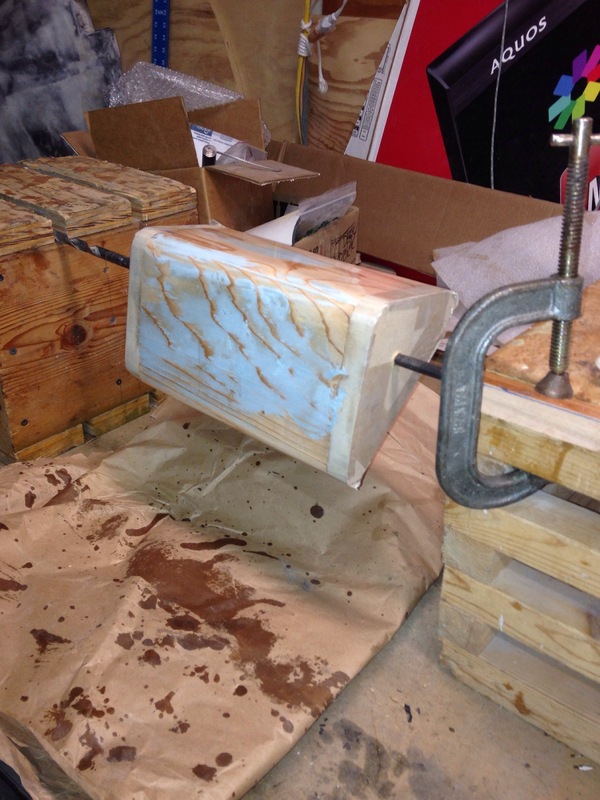 Got me thinking that we really shouldn’t move a piece at all during the wet out process. So today we tried marking the first-to-table peel ply with the exact foam core locations then taping the peel ply taught at the corners. This worked well. 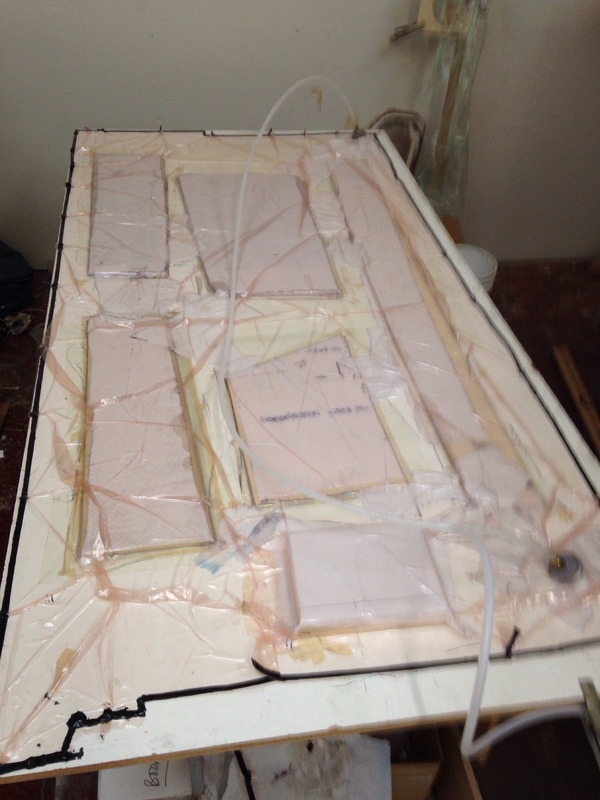 Here’s the galley countertop – the darker yellow foam is high density for the faucets area. 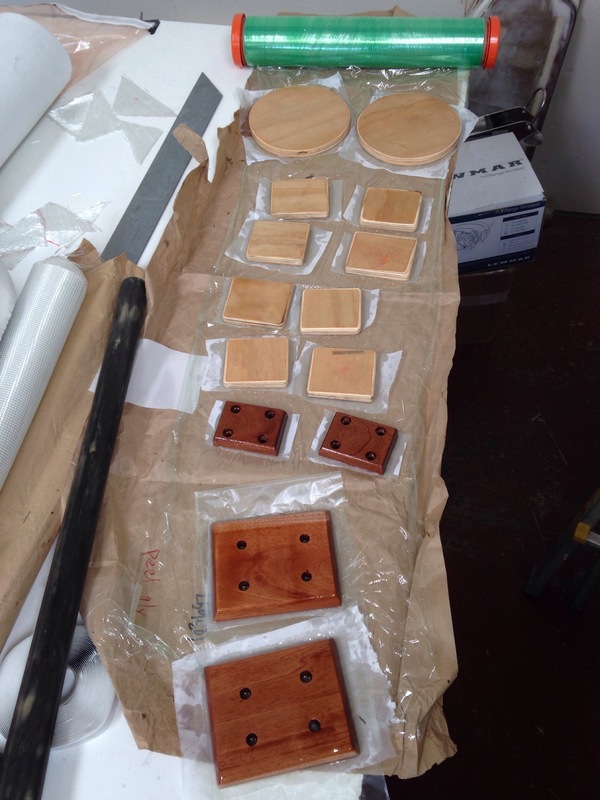 These four pieces (various galley parts) are what took 3 hours to get ready – that’s about par for our course. 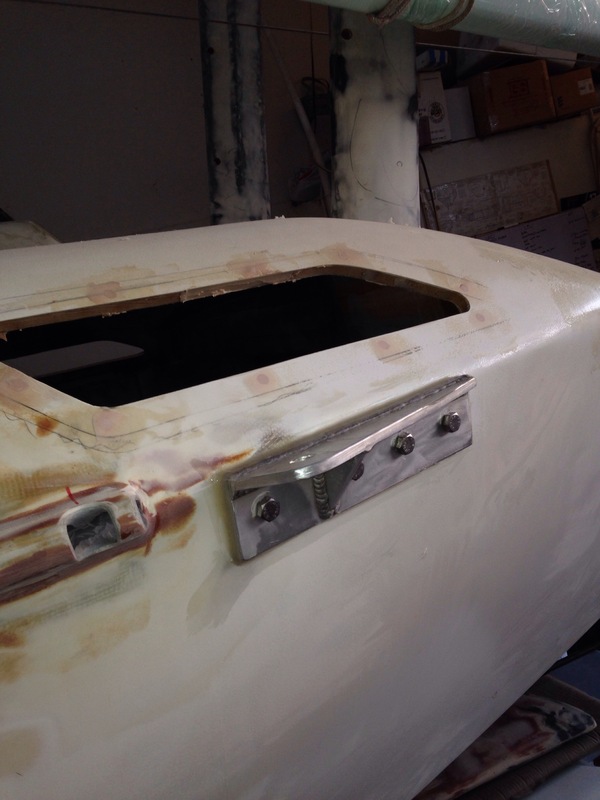 As we finish up the exterior of the whole boat now, there’s a short list of ‘modernization modifications’ that should be done because better ideas have come along since this build began nearly 20 years ago. 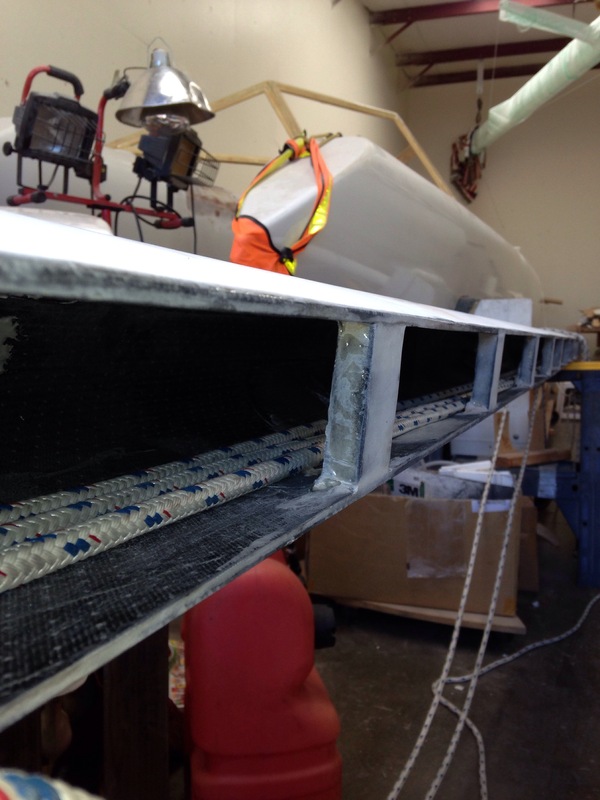 The six foot bowsprit gets a bobstay from the end of the pole down to the bow of the main hull just above the waterline. 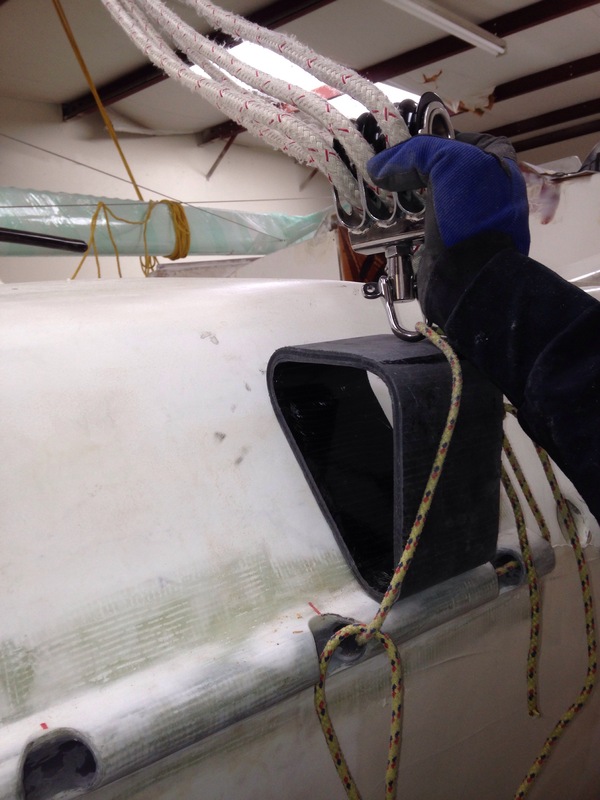 We have a stainless steel u-bolt installed to carry this big load as the spinnaker pulls up and forward. 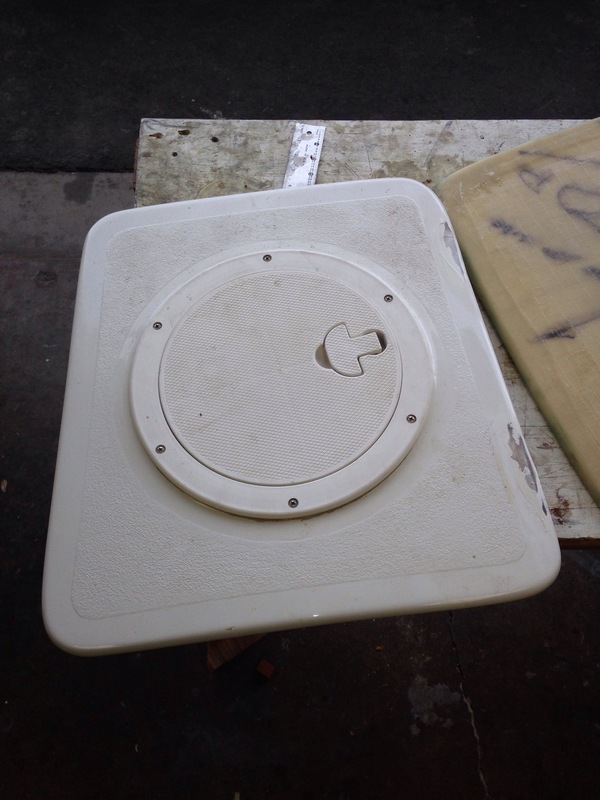 But the u-legs are not in line with the force, and the backing plate is measly. Over time, and probably way out on an ocean, this will become trouble. 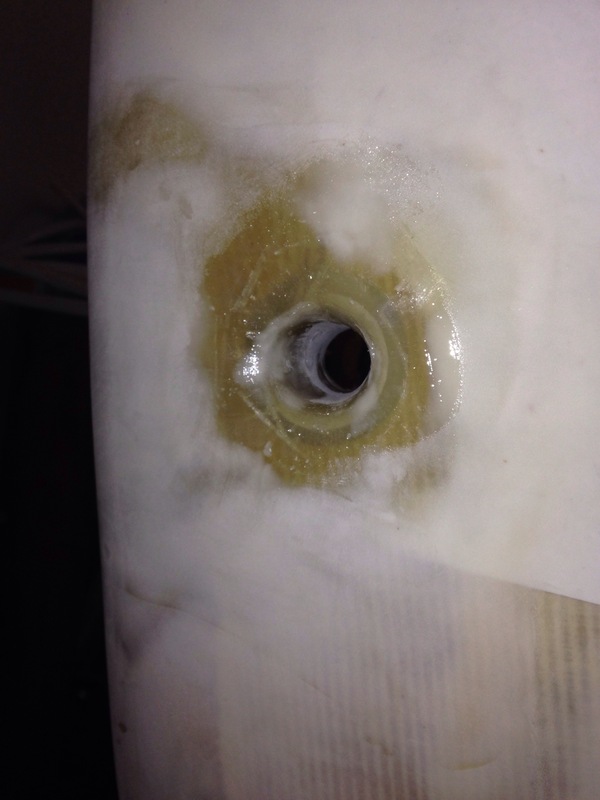 First we tried removing the fitting, but the epoxy was bonded around the threads so this thing was never coming out. We cut and ground it below the surface and entombed the legs and nuts in the new reinforcements. 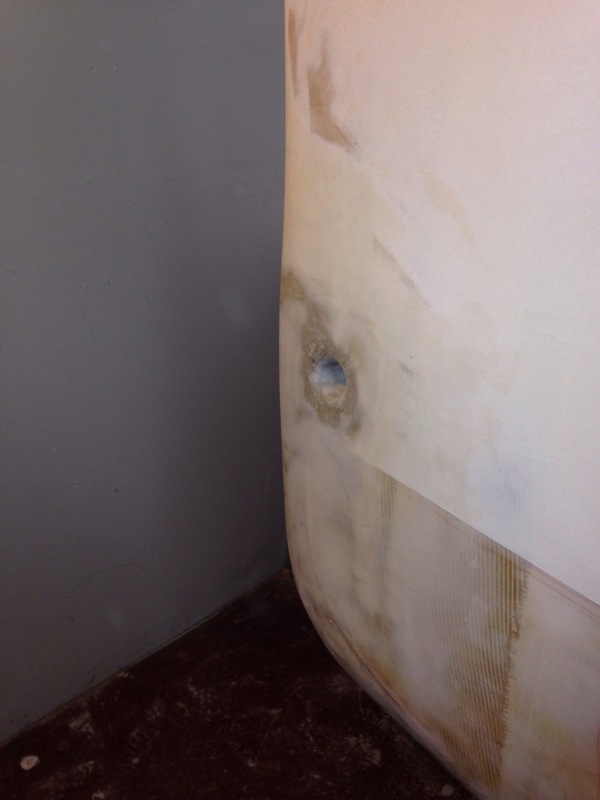 The new hole was cut about a half inch aft of the point where the hull sides meet to form the bow stem. The tube shape is a 1-1/4″ PVC pipe. Inside it got a wedge of high density putty that makes a solid wall, then uni fabrics to spread the load, take over for the PVC, and tie the two hull sides together. 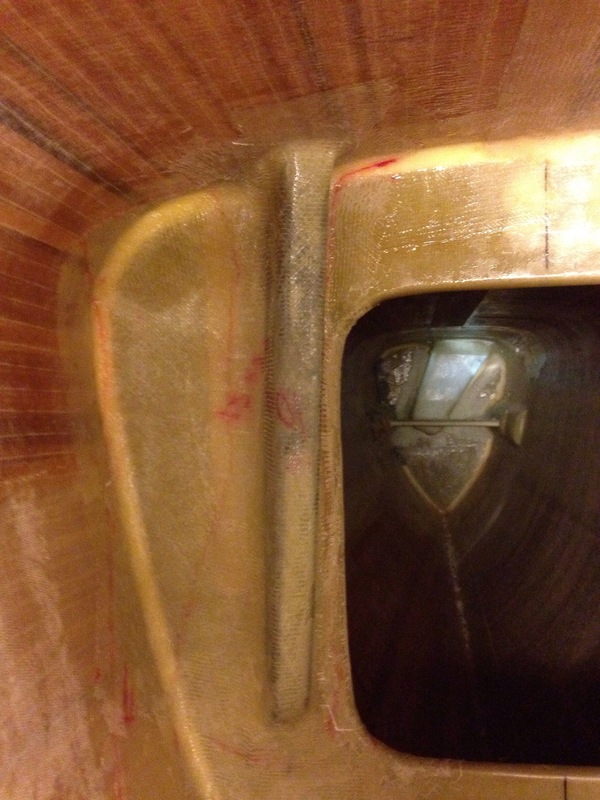 The access was tough, reaching just far enough inside the watertight crash bulkhead. 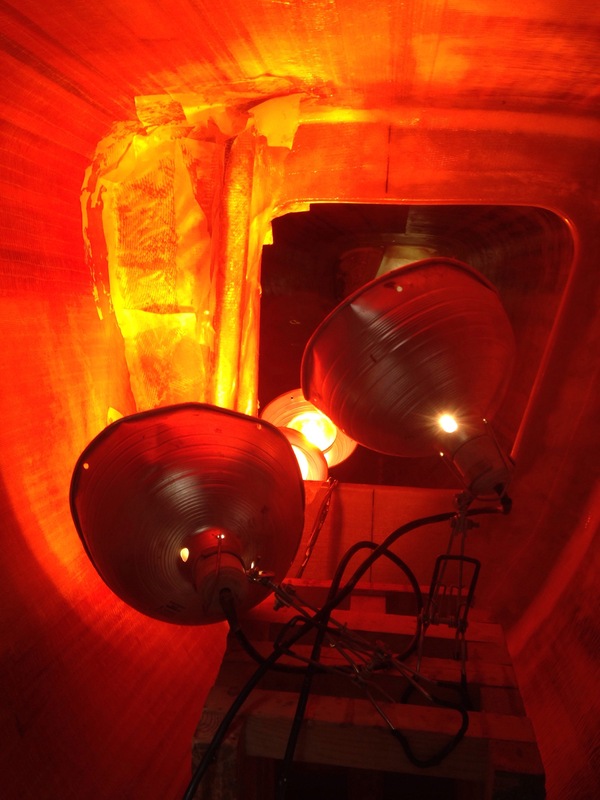 Then from the outside we ran strips of uni through the tube and radiated the ends out around the hull about 4″ on both sides of the boat. 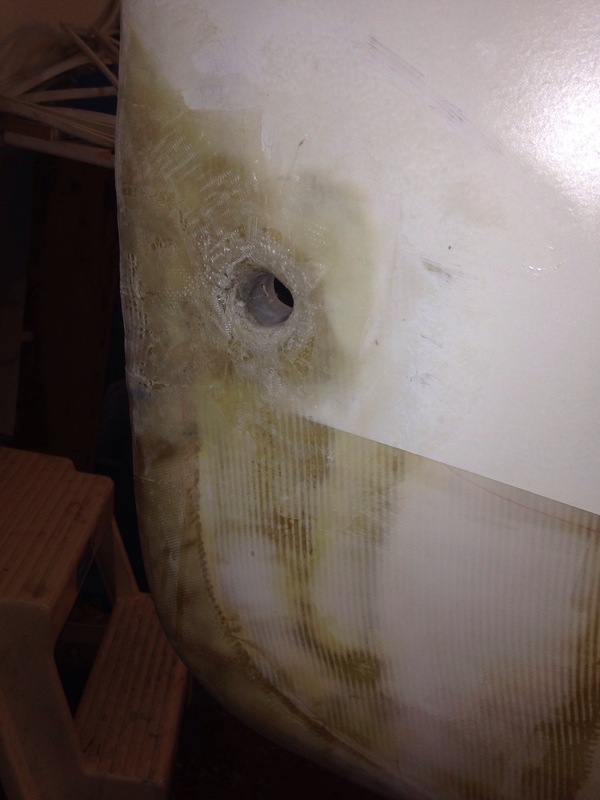 Three extra layers of uni glass were laid along the pull direction, and that’s what made a bulge on the bow stem just above the new hole height. 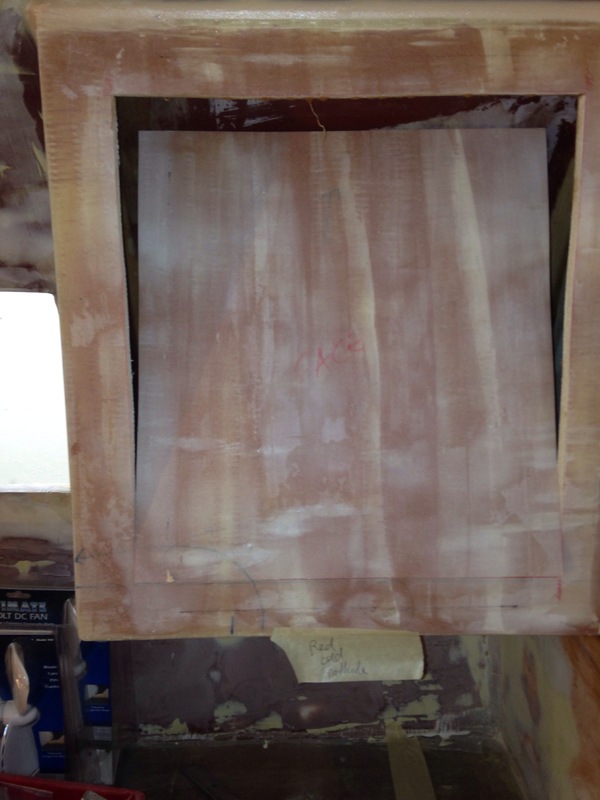 Then some ‘finish cloth’ bidirectional 6 oz was added to tie it all together before fairing. Here’s the work in progress after two fairing passes. 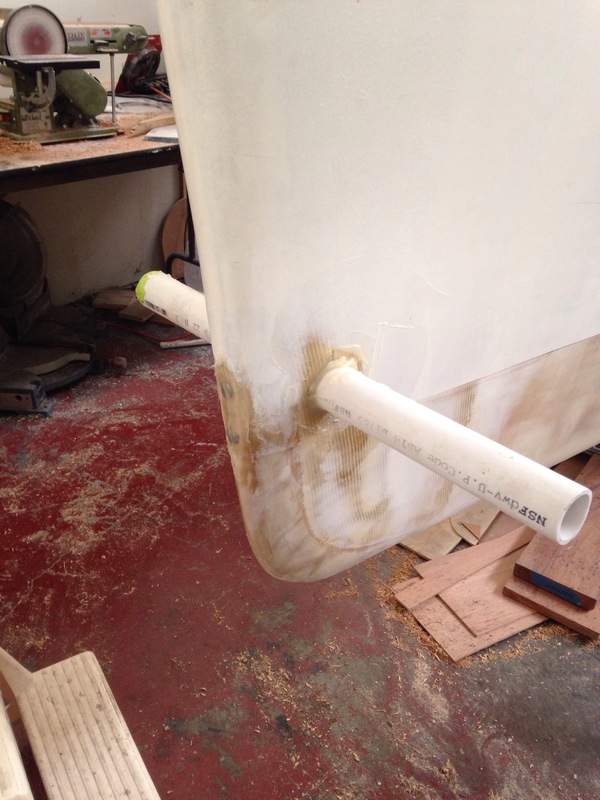 The new bow hole seems plenty strong to better distribute the sails’ force, and no chance of leaky and fatiguing metal. Feels like ten hours well spent. 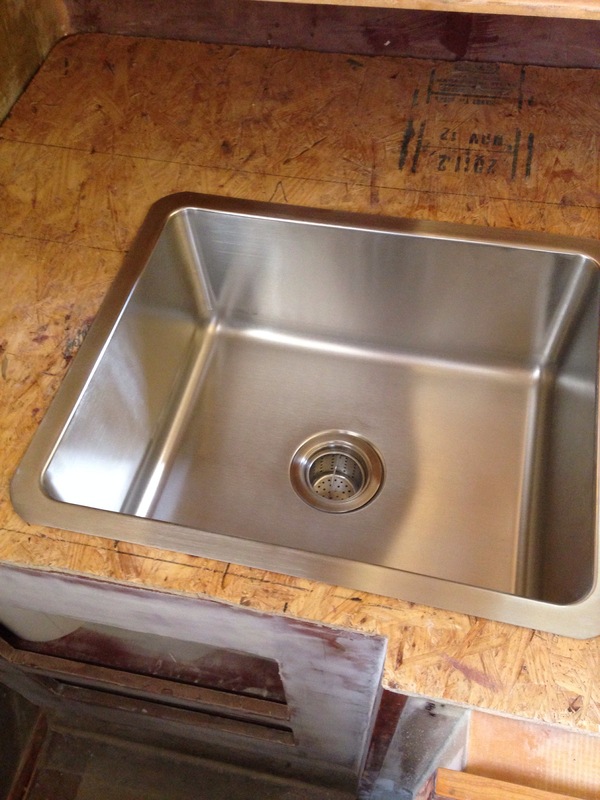 And here are the photos I mentioned last week about saving some $ on more metal fittings. 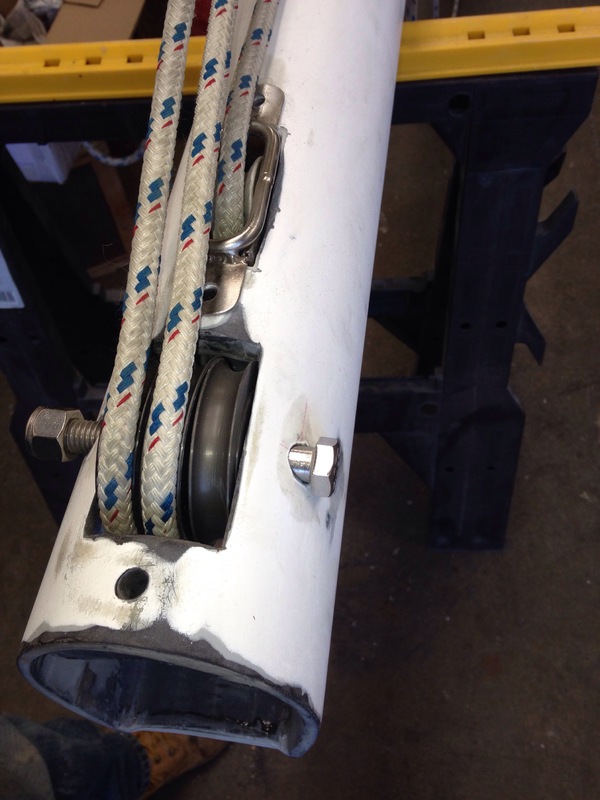 These are the attachment points for the nets up at the bow, by the anchor. Sort of mini versions of the story above. The exterior punch list is almost done, and we’ll get back to the cabin build by late next week. 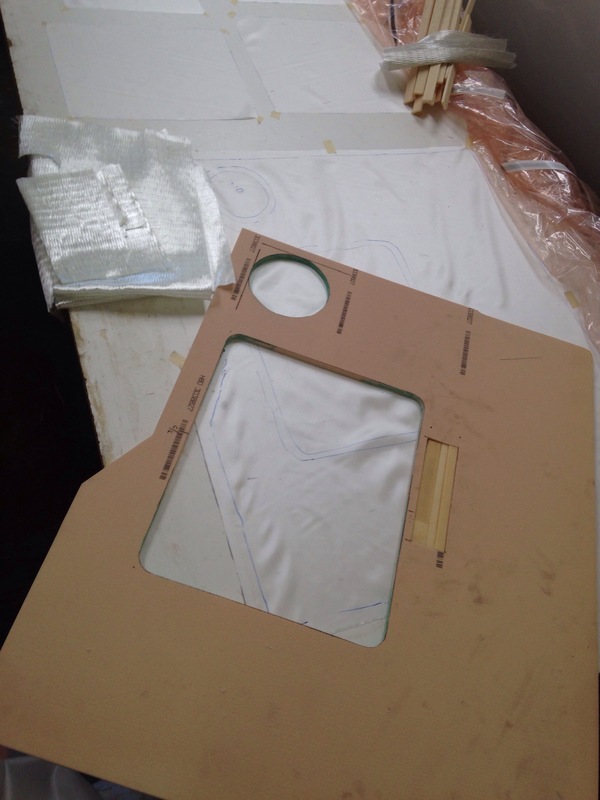 This little pile of fiberglass fabric doesn’t look so bad, right? It started the day headed in to the floats to glass in the chainplates. 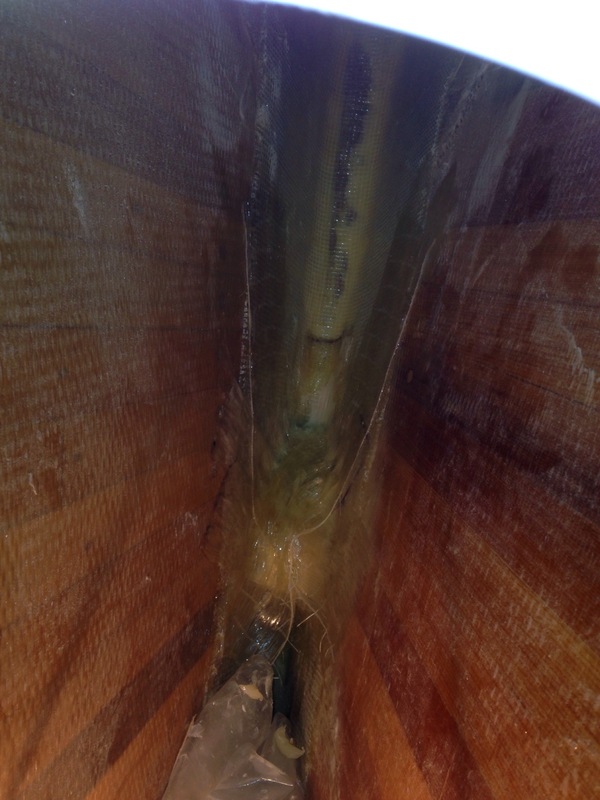 But crawling around inside these outer float hulls in the dark with no soles (floors) and stoop over headroom makes for a challenging day. The builder gets to do a circus acrobat move to get thru the bulkhead opening seen in this shot. 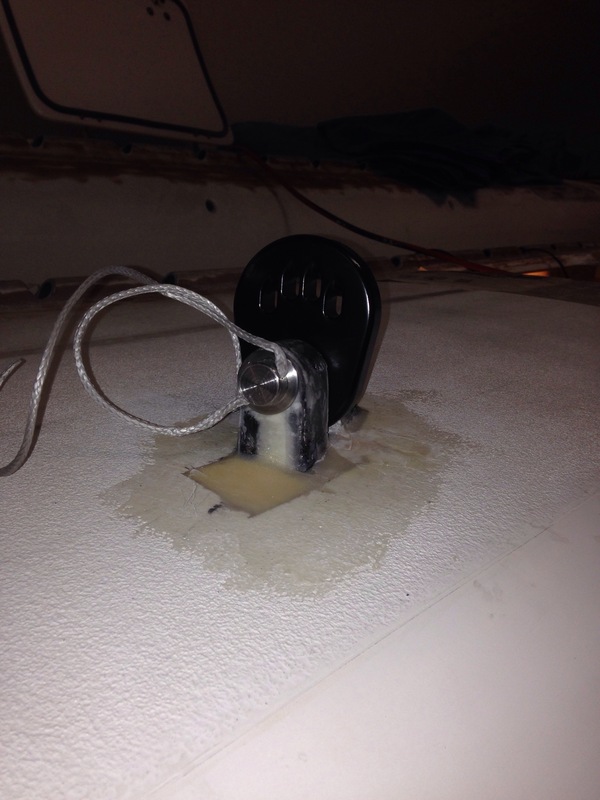 These lamps got the air temp to about 120 and the radiant heat was well in to the 160 range without trying to put this 35′ boat in to that auto paint booth we saw the other day! 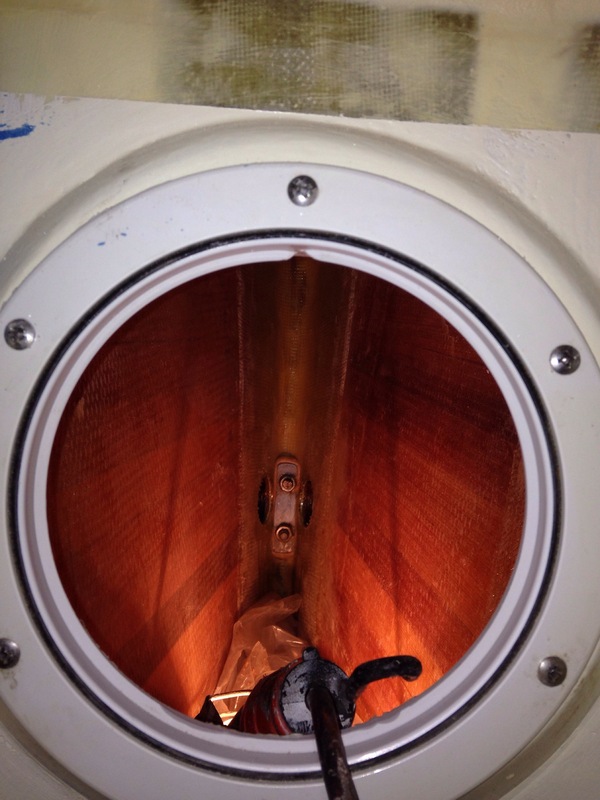 So it’s a localized heat post curing process inside the floats. The other side is under the lamps as this is written, with a sore back and various bruises. 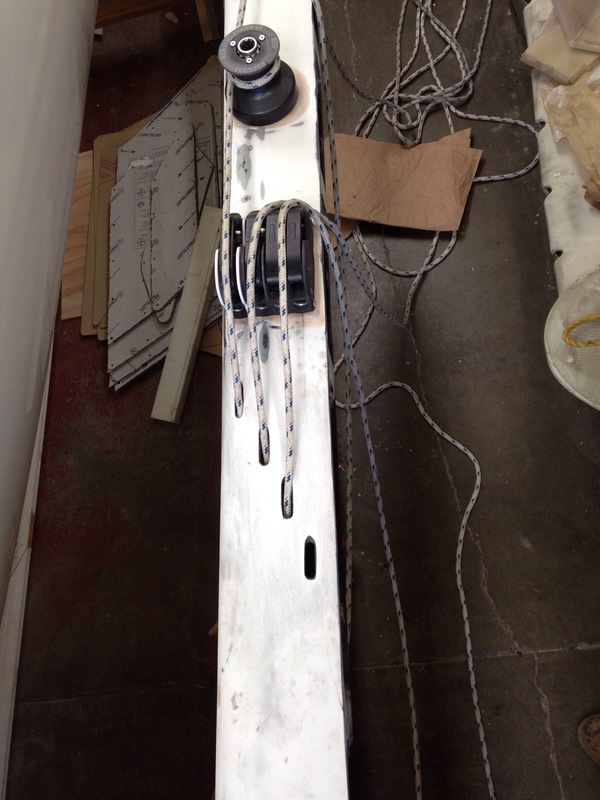 Boat bit back a little today, but she now has very strong anchor points for the 50′ mast. And from aft, looking forward. 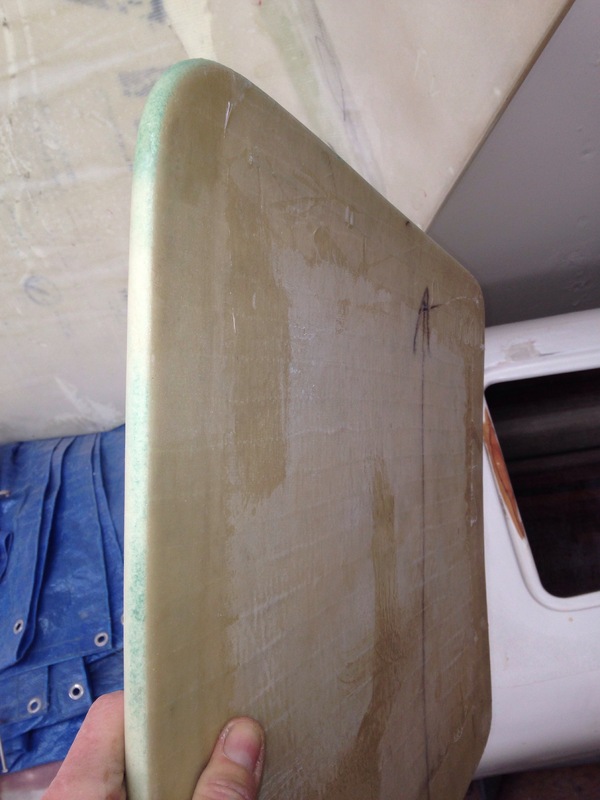 The glass looks a bit green in these photos – that’s the look of the resin still in curing / hardening mode. In a few days it will go basically colorless. With a bit of shaping around the base, the Colligo “Terminators” fit right in. 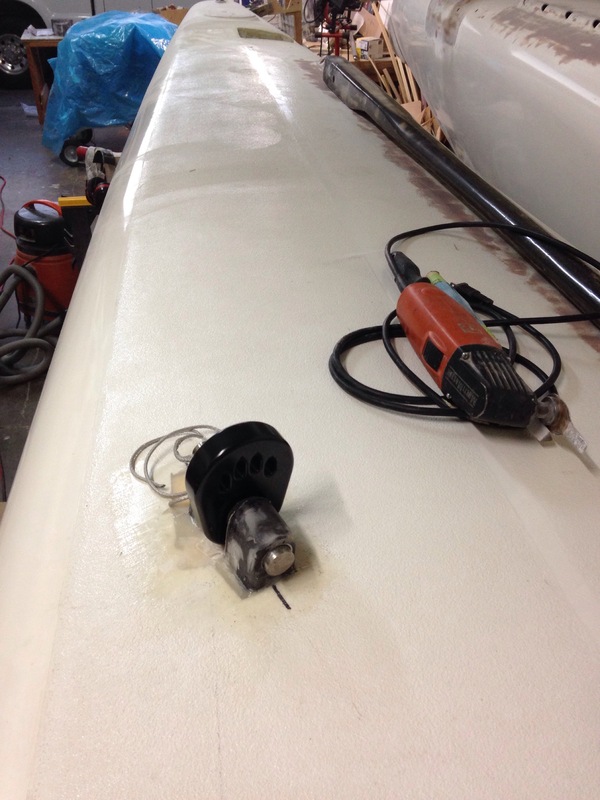 The last step is some lightweight finish glass cloth around the fitting up on deck – that’s a tiny job in the scheme of this project, so we’re pretty relieved tonight. Looking over the master to-do list, seems we’ve past the milestone of completing major structural builds. The chainplates had been looming, and the rest is non-load bearing / furniture type stuff, then fairing,sanding and prepping for paint. Who had an EasyBake oven? The Sheetrock box went away and over a year we built a pile of stuff for the curing oven, capped off by the chainplates. 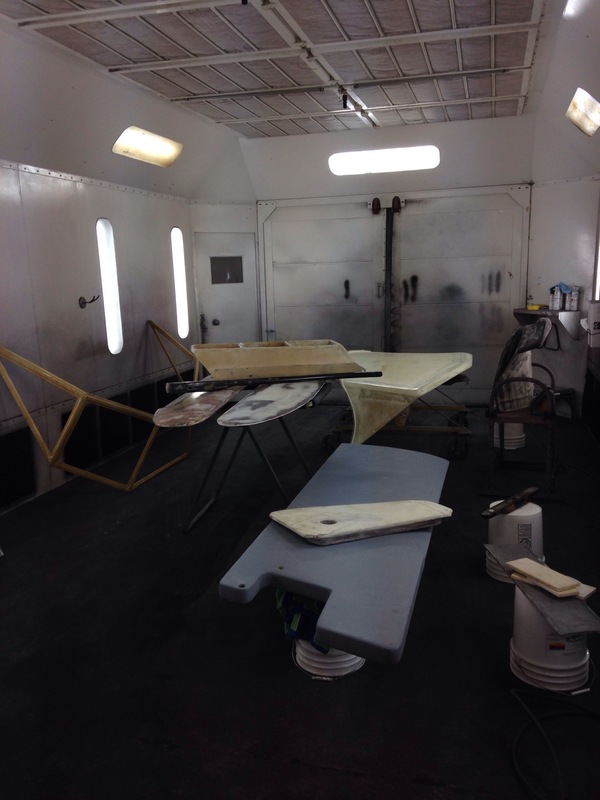 Today was the day for PrismaCar’s paint booth. 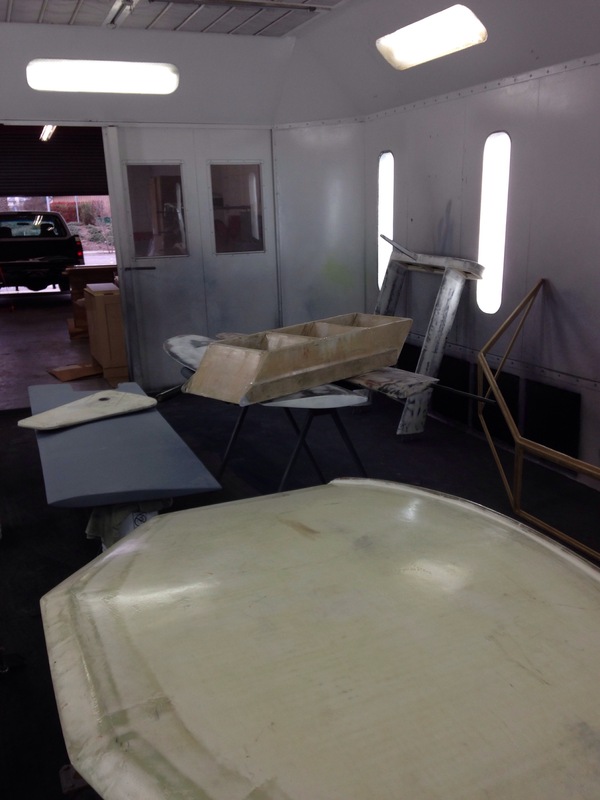 For our records, the booth ran 3 hours at 170 degrees to cure the dagger, both rudders, all steering parts, chainplates, mainsheet anchors, windshield, hardtop, boarding ladder, stern tower, windlass platform and boom end insert. 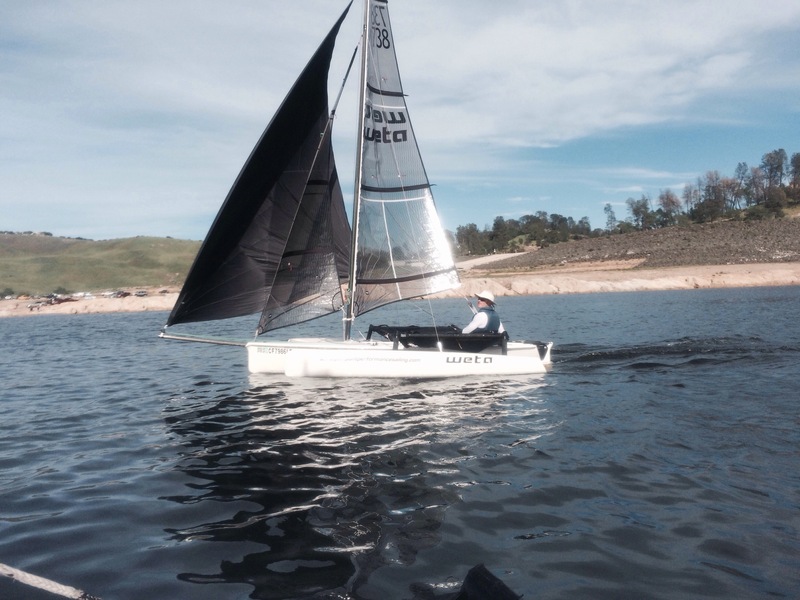 Thanks to owner Harry Strouse for the $50/hr cash rate – worked out well for both of us. 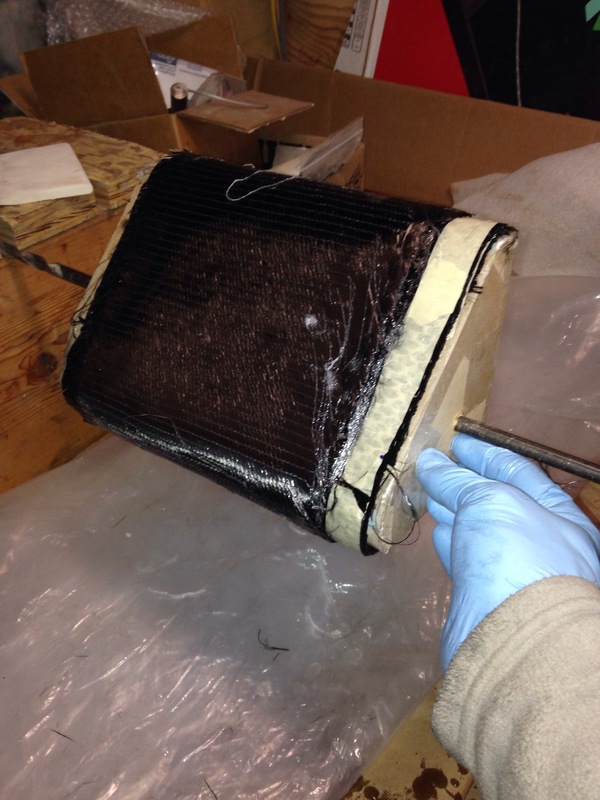 And the shop guys were amused by having to move a car out of the booth for these weird boat parts. After the field trip, the chainplates went directly to their new homes. Here they’re wedged / suspended in position with some of the bedding compound applied. 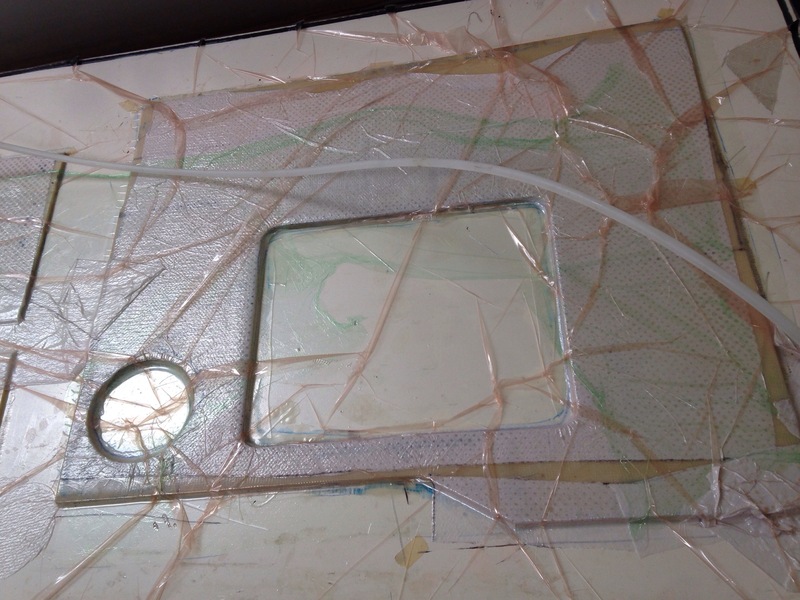 Tomorrow will be the rest of the filleting and maybe the glass work. 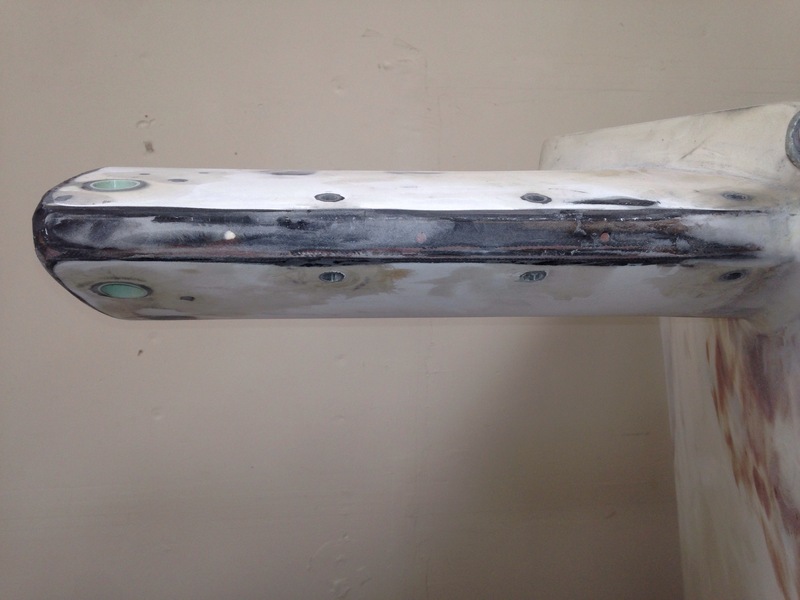 Deck hardware continues to be test fitted, then all holes over drilled and re packed with epoxy putty, hardware final fitted then removed for the paint job. 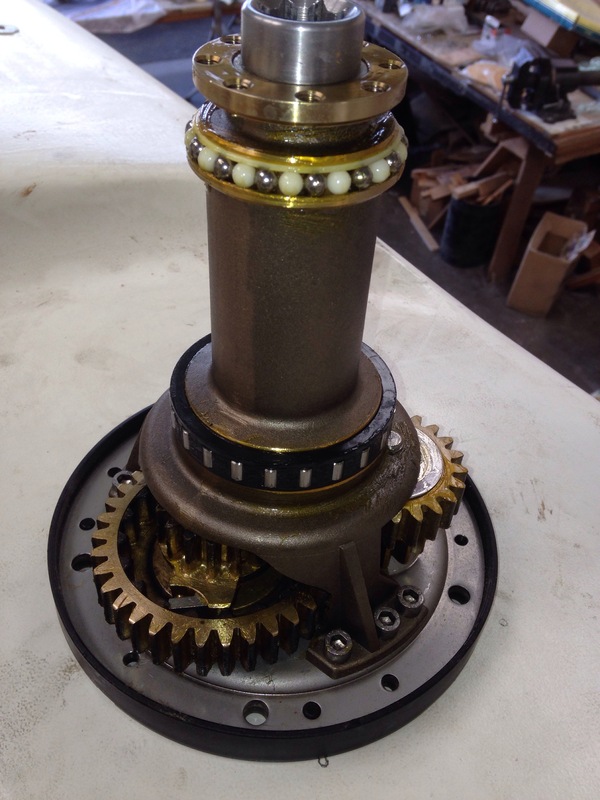 But there are a few permanent mount metal and carbon pieces that will get painted in place. 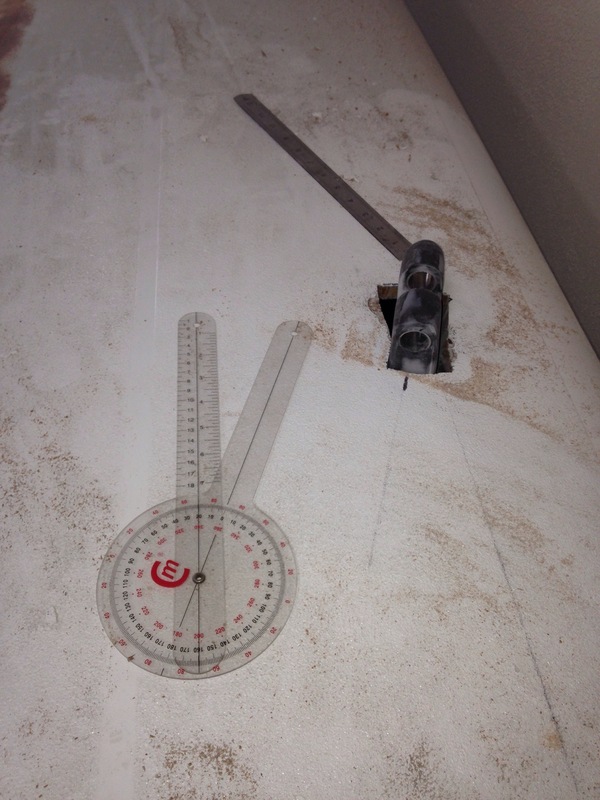 Today we bonded on (and bolted) the receiver points for the aft beam triangle braces. These were a lovely aluminum welding job done nearby. 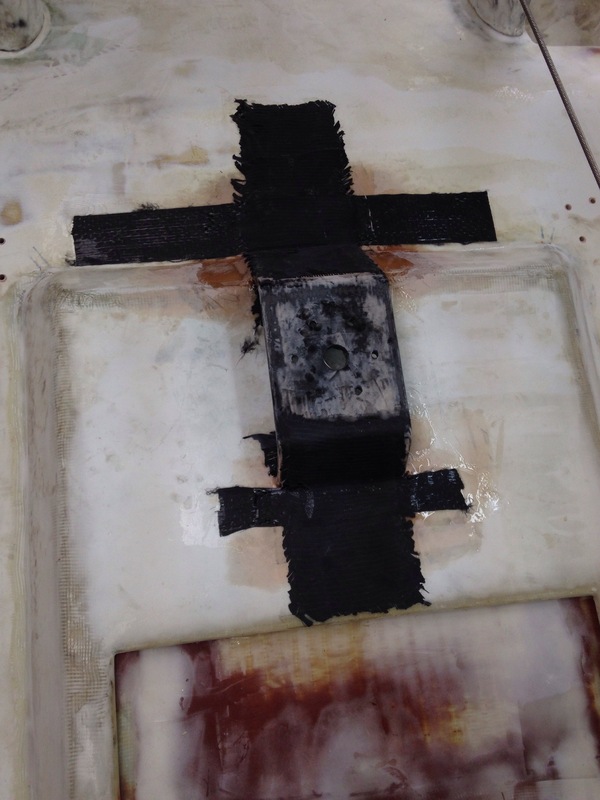 Yesterday the pieces were chemically etched with the West Systems aluminum prep (a two part easy to use ten minute job – buy the small size as it goes a long way) then coated in clear epoxy. They were dry and ready for bonding today. The window cutout made it an easy-reach one person job to tighten the bolts. That was just coincidence, not swell planning. And at days end we “paid” for half the morning bake by figuring out to eliminate some hardware up on the bow – we’ll see how that turns out tomorrow. 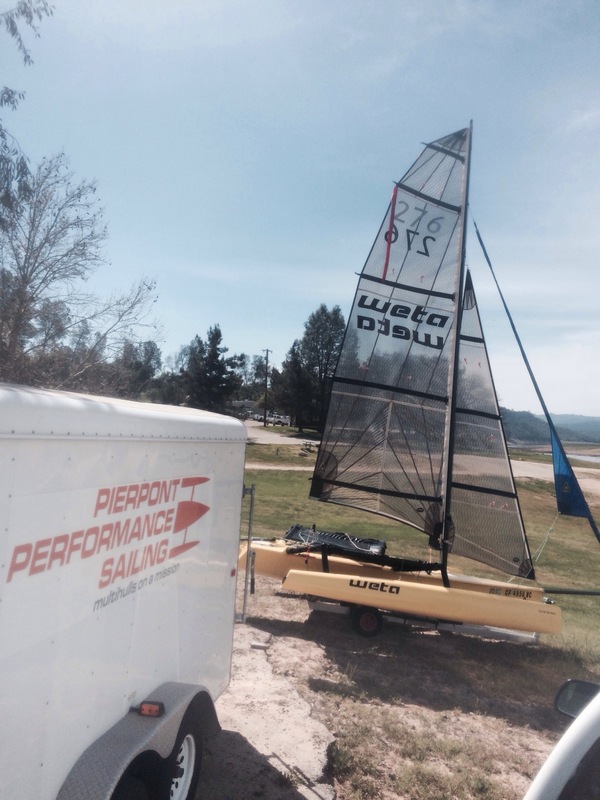 Seems to be a theme around here right now – make sturdy bases for the sail rigging. This takes many forms. 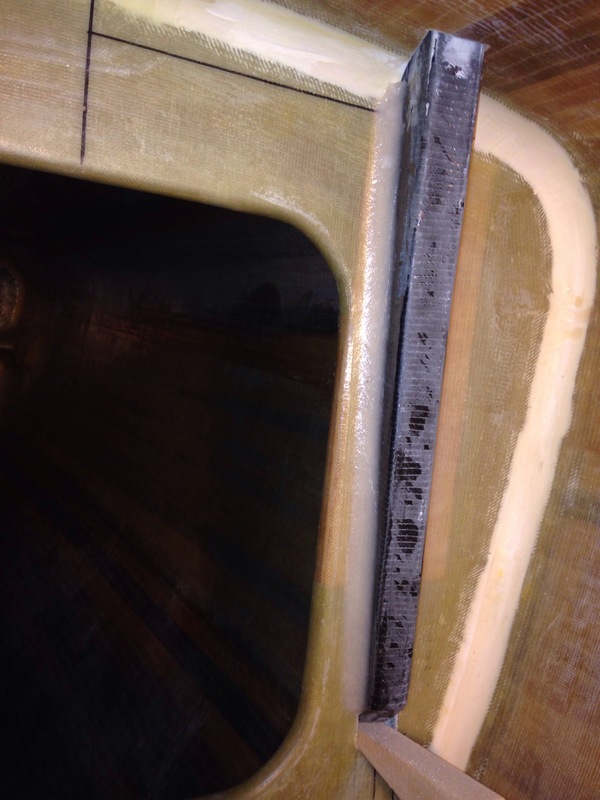 Keith pointed out that the cap shroud chainplates as shown last week really should be swiveled 20 degrees off the centerline so the pull against the big clevis pin would be directly in line with the mast. He’s right, and this is another small improvement modification beyond the decade-old F39 plans. 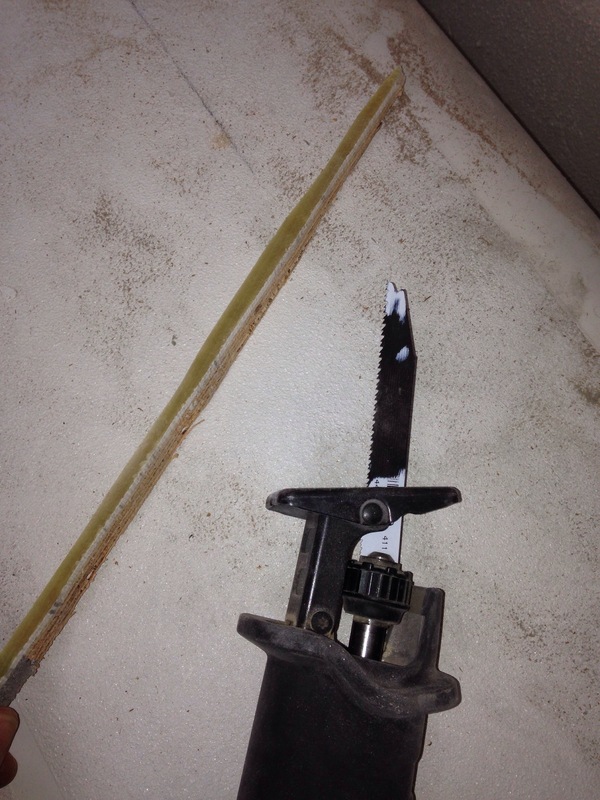 Cutting that bulkhead slot was tricky last week, but a $2 short blade for the sawzall made the extra 20 degree slice easy. So now the plates fit at the new angle. 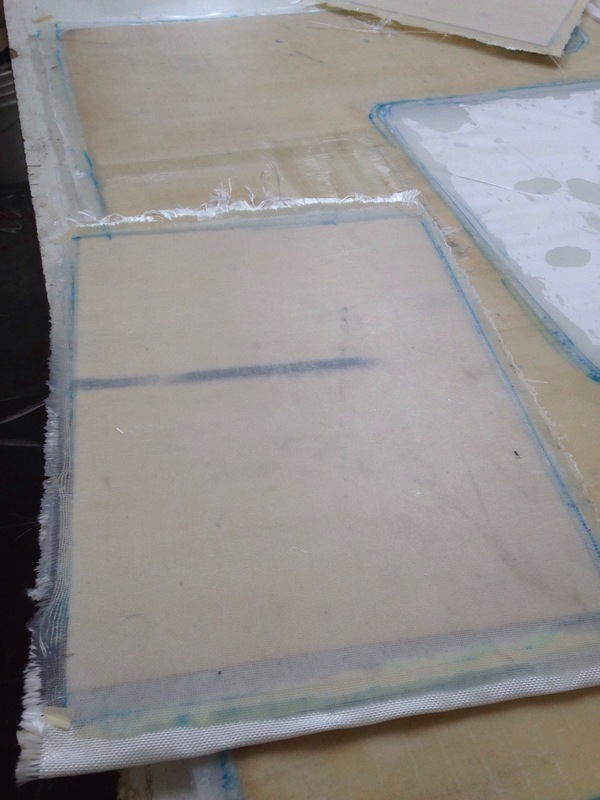 The rod made it easy to rotate the piece as ten layers of various fabric orientations went on. This thing should be plenty strong. It was cut in two, and the form knocked away after this next photo. Tomorrow morning it joins the other pieces headed for the post-cure oven. 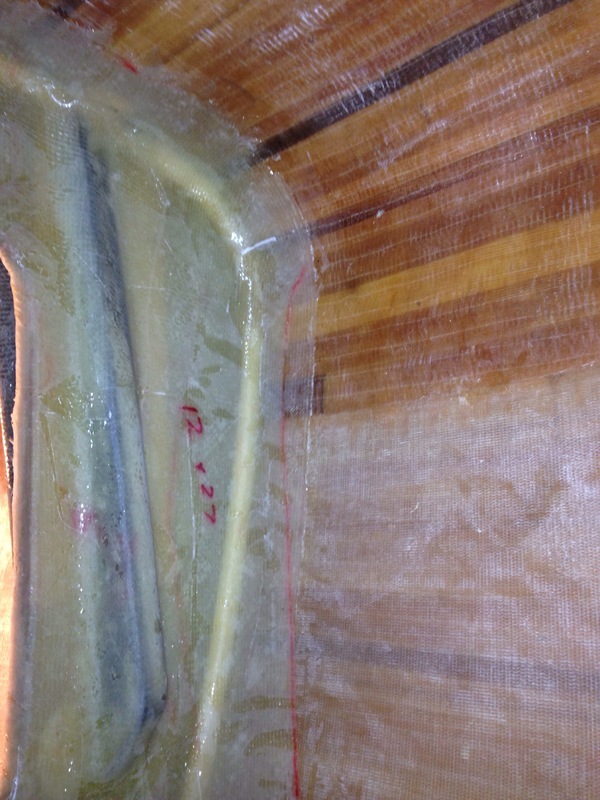 Gotta get up early to load things for the big oven post cure bright and early Monday. Stay tuned!